Walter Jones, Former Seattle Seahawks Left Tackle Walter Jones Was Inducted Into The Pro Football Hall Of Fame In 2014. He Had No Peer. As A First-Round Draftee, He Anchored That Position Right Out Of Florida State for Thirteen Seasons, Starting In 180 Games From The Day He Put On A Seahawks Uniform. His Dominance On The Left Side Of Seattle’s Offensive Line Is How So Much Yardage Was Opened Up On His Side And Why His quarterbacks Were So Successful. Jones Allowed Only 23 Quarterback Sacks During His Entire Career. He Is One The Reasons The Seahawks Got To The 2006 Super Bowl, Although Falling Fo Pittsburgh 21-10. 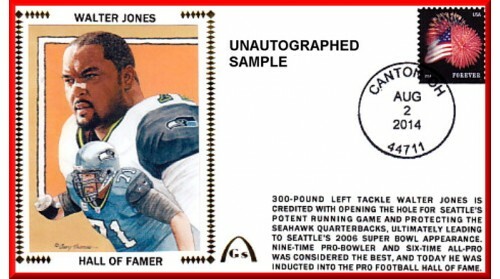 Jones was Highly Honored, Having Been Named A Rookie Of The Year In 1997, He Built A Resume That Includes Nine Pro Bowls, Five-Time All-Pro Honors, And Membership To The 2000s All-Decade Team.